CARPET BEETLE LARVAE MONITOR: 1 ea. 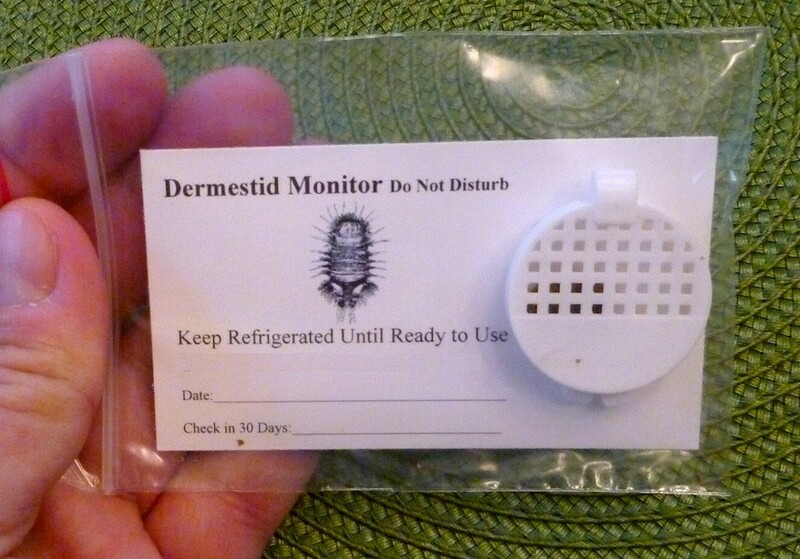 Set these out where you've seen or suspect carpet beetles or other fabric destroying dermestid larvae to be active. These monitors use a strong food based lure and will readily attract and keep dermestids close. The Bait Station comes attached to the "business card size" form seen in this image. Set out both and be sure to record the date you place it out. Inspect at least once a month; once a week is preferred. Change every 30-60 days or sooner if bait chip is depreciated. You can see the bait chip inside the bait station; it's a small wafer like disc. Store unused Monitors in the refrigerator to insure they stay fresh. Remember, these bait stations are really monitors and not traps meaning they will not "trap" insects like glueboards. However, carpet beetle larvae are slow moving and easy to remove or destroy once you see them. Activity noted in and around these feeding stations means you have an active problem that needs further attention and most likely a thorough treatment of the carpets, furniture and other fabric in the area. Set out one monitor every 250 sq/ft. The traps are pheromone specific so you will need both types if you suspect you have both species active. Fortunately our cart will let you "mix and match" meaning you can get some of each and still qualify for any quantity discounts that might apply. As for the dermestid monitors; they use a food based lure and if people or pets eat it, we'll just digest it as food. Give us a call if you need more help. Our toll free is 1-800-877-7290 and we're open 8:00 AM to 7:00 PM Mon-Thur; 8:30 AM to 5:00 PM Friday and 9:00 AM to 1:00 PM Saturday, Eastern Standard Time.